This book is full of significant nuggets on treating people in pain even though Dr. Fordyce wrote it over forty years ago. I thought I would share one that was on the second page of chapter one. 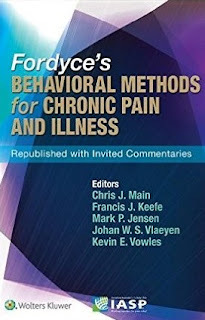 Reading this I can see the influence Fordyce had on Johan Vlaeyen (another editor of the republished work), when Vlaeyen stated last year at a conference I was at: “Pain is about behavior.” Bill Fordyce was one of the early pioneers to see pain beyond a biomedical approach. He points out in this text that pain even extends beyond the neurophysiology of the brain also. It is seeing pain in the broadest context of a biopsychosocial approach and behavior. 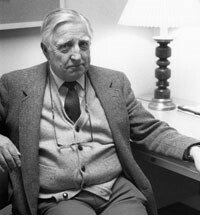 He points out the importance of biology and neurophysiological aspects, but potentially even more important the social components. While this was his point over forty years ago, I would argue we still struggle in the medical community to see the importance of these social behaviors within the pain experience of individuals as they come to us each day in pain. In addition, the research into these social behaviors is woefully lacking. Pick up any medical journal and look for articles that are looking into pain and you will see the discrepancy of what we are looking at in trying to understand pain. How many articles are directed toward the biological end of pain, how many at the psychological end compared to how many toward the social aspects of pain behaviors. We see the variations in our patients daily and Fordyce points out these variations can be attributed to the inevitable result of learning and conditioning. Okay your turn: Are we looking into the learned and conditioned behaviors of our patients? How do you do that? Do you need to or is that someone else’s job? – What say you?